St. John's Wort can be a powerful natural medicine for temporary depression. It has become a popular herbal supplement for controlling stress and getting over the blues and has also been used to treat chronic fatigue syndrome, anxiety, and other ailments. It has been useful in treating the mood swings associated with menopause and PMS and it is considered a mild sedative for treatment of insomnia. Although St. John's Wort does not actually increase the total sleeping time it may increase the time spent in deep sleep by helping to produce melatonin, a sleep-regulating hormone. It is thought to be good for nerve pain and it is sometimes used to improve the long-term nerve damage caused by uncontrolled diabetes. This herb has the ability to help the median nerve in the wrist facilitated pain relief in some carpal tunnel syndrome tests. St. John's Wort, as an analgesic, may be used externally for burns, bruises, injuries particularly deep or painful wounds involving nerve damage, sores, sciatica, neuralgia, cramps, sprains and tennis elbow. The pain relieving properties have been beneficial in easing the vocal pain and laryngitis associated with fibromyalgia. It is also said to relieve tension headaches, because of the herbs ability to relax blood vessels and increase blood circulation. It may be helpful for relief of those headaches that accompany hay fever. St. John's Wort is proven to be an effective antiseptic and when used topically, it helps to heal wounds, prevent skin infections, keep open wounds from becoming infected and even counteract staph infection. It has been used beneficially used for herpes virus, cold sores, shingles and fever blisters. The antiviral process triggered by St. John's Wort appears to be enhanced when the user is exposed to sunlight, and the same thing applies when the herb is used topically for vitiligo, that the results are favorably affected by exposure to sunlight. St. John's Wort is said to have a calming effect on the digestive system and is thought to be effective in the treatment of Crohn's disease, irritable bowel syndrome and a variety of digestive ailments. St. John's Wort is an astringent herb and an anti-inflammatory that can promote healing, reduce inflammation and swelling and may help to relieve hemorrhoids. In some lab studies, it was shown to protect bone marrow and intestinal mucosa from X-Ray damage. Ingredients: St. John's Wort, Structured Water, 20% Alcohol. Non-Alcohol: St. John's Wort, Structured Water, Vegetable Glycerin. Contraindications: There are many warnings associated with the use of St. John's Wort, as it may have potentially dangerous interactions with prescription drugs, and one should always consult a physician when taking prescription medication of any sort before using this herb. Pregnant women should avoid this product, and those who are photosensitive to light may experience an allergic reaction when exposed to sunlight or may become sunburned. Some people may experience stomach upset, restlessness, mild allergic reactions or fatigue when using this herb. Although it is called nature's Prozac, it should not be taken by those who have chronic or clinical depression and should never be used with prescription anti-depressants or any medication that interacts with MAO inhibitors. Those who take anticoagulants, oral contraceptives, sedatives, antidepressants, anti-seizure medications, high blood pressure medication (with ACE) inhibitors, drugs to treat HIV or drugs to prevent transplant rejection should not oversedation's Wort. 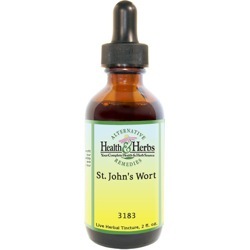 Do not take St. John's Wort if you are planning to undergo any type of surgical procedure. Aside from its blood-thinning properties, the herb can intensify the effects of anesthesia, resulting in over sedation. From Raekwon N. Morgan of Boston, Massachusetts on 2/18/2018 .